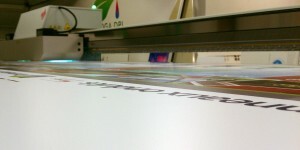 Large format flatbed digital printing is a direct to substrate printing method that reduces cost and production time for signs and graphics. Using the latest Oce Arizona flatbed technology we can produce 4 color graphics with white ink and clear varnish effects. White ink flatbed printing is especially valuable for day/night backlit printing commonly used in shopping mall and airports. Common products produced include pump toppers, aisle violators, yard signs, retail store signs, directional signs, backlit signs, POP displays, museum graphics, park and trail signs, and trade show displays.